"As an expert tracker and infiltrator, CRANKCASE serves MEGATRON from the shadows. Unseen and never recognized, he watches the AUTOBOTS and reports their movements back to his master. He rarely engages in combat, but when he does, it is swift, terrible, and final." None of the windows are transparent or painted to imply so, but there is clear plastic for the headlights and police rooftop strobe lights. The wheels are painted ABS. His head features red light-piping in all four of his eyes, but it isn’t very effective. Crankcase has a blaster with a spring-loaded lever that transforms it into an extendable claw! However, he cannot hold anything in his open hands, and so the blaster (or any other MechTech accessory) pegs into holes in his forearms. 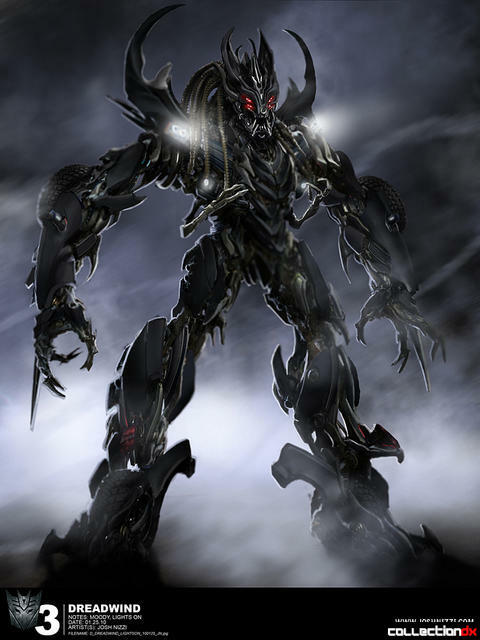 Though his screen time is minimal in “Transformers- Dark of the Moon” and he has little-or-no character development (he’s just an aggressive hunter-bot with brass chain links for dreadlocks), he is the only one of the three Dreads that are seen pursuing the Autobots as they try to hide Sentinel Prime that got a toy made of him. (Well… Okay, they did make a Legends-class of one of his cohorts, but I don’t think that really counts since it’s so small and lacks sufficient detail.) I got this toy on an impulse buy before I saw the movie (which is rare for me to do), so I got him based squarely on his looks. I must say that he’s a downright dangerous-looking bot! There will be no mistaking this guy for an Autobot if they try to repaint him, I’ll tell ya that! In the grand scheme of things, it’s just an average Deluxe-class Bayformers figure. The detailing is outstanding, especially on his torso and head, and the vehicle bits are distributed pretty well (despite sticking out kind of awkwardly along his biceps and shins). There’s minimal paint along his arms and thighs (well, none really), but you truly don’t miss it because you get wrapped up in all that alien techy goodness that is Bayformers. My biggest problem with him, though, lies in his transformation. Oh sure, he gets compacted down quite nicely in SUV mode, and most of the vehicle shell ends up accordion fashion on his back. (In fact, I’d only call the panels along his arms kibble, because the back panels are compacted down so nicely, and the ones on his arms have a tendency to get in the way when posing him.) The issue I have is that most of his transforming bits don’t snap or lock into place. This is especially noticeable with the mounting points for his wing-claws, wheels under his elbows, and lower legs. So, posing can be tricky at times because things shift when they’re not supposed to. Also, despite having friction-turning joints in the right place, his ankles aren’t posable, nor do they snap securely into place. It’s a shame about the light piping, though, because he really needed that boost to remind you that he has four red eyes in amongst the sharp angles and “Predator”-like maw. Despite a few weak areas, Deluxe-class Decepticon Crankcase is a very satisfying toy, and I strongly recommend getting him just for his sheer badass-ness. I have this guy, and he is very cool. I don't like how you have the feet parts hanging low in vehicle mode, and mine was one that has clipped fingers. Apparently there were some safety concerns - early releases like yours have the fingers, later releases have them clipped short and blunt. Wait- how *I* have the kibble hanging low? That's how I got him! Yeah, the dreadlocks are a bit of a pain to deal with since, ironically, they're so inflexible. In vehicle mode, you're supposed to push the dreads together so the left one overlaps the right one, and then his chest goes over them. There are three versions. Cliped fingers. Long middle fingers And a revised sculpt where the fingers are shorter but still detailed. Yours is the revised version. Having only the cliped version myself. I would rather have this revised version. He's a cool sculpt with a simple and fun Transformation. Like many of the dark of the moon deluxes. They initially strike you as kind of boring because of their movie appearance. But after you play with them a bit there is an intuitive and dynamic toy under that surface.